It's the end of the semester and everyone's stressed! It's awful. What a terrible way to end the semester. Stressed and everything. I'm putting Christmas/Holiday music on. That seems to always calm me. It's been a while since I've blogged. I was planning a more thoughtful post but I really just need to blog so I'm just going to do just that. Um, hmm, I changed the layout to my blog slightly. I don't think you've noticed but I got rid of the categories and added five random posts to the right margin. It was always difficult for me to just categorize my posts. And it makes so much more sense to just use the search function. And when it comes to labeling, all that matters is the labels below, where anybody can label it. BLAH BLAH BLAH. I'm not really cohesive right now. I'm also thinking in triples! I think I'm going to pull a late night tonight. I don't really have anything really important tomorrow that needs attention until later in the day, and I'll be awake by then. I'm doing Facebook friday again. I don't know if I mentioned that last year, but it's when me and my good friend, my roommate, gave up Facebook except for fridays. Hence, Facebook friday. Last year, we just trusted ourselves not to go on. This year, we changed each other's password. It's terrible how reliant we are on Facebook. I applaud people who don't use Facebook – they do exist, I know one or two. Well, I'm going to shower and then do some work. My roommate did a fantastic job making our room ready for the holidays. 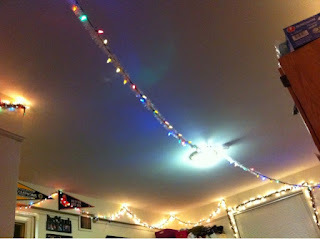 Here's a pic of some of the lights. There's a lot of it. It goes all around our room.